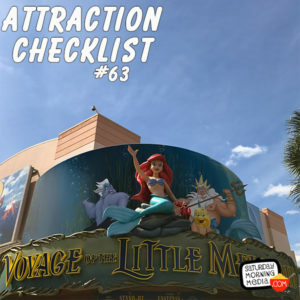 http://www.attractionchecklist.com – This episode I visit Disney’s Hollywood Studios in Walt Disney World to watch the puppet filled Voyage of the Little Mermaid. Recorded on October 25, 2016. Today we head to Disney’s Hollywood Studios to check out Voyage of The Little Mermaid. The guide map describes this attraction in the following manner: Celebrate the highlights of The Little Mermaid in this live show. This attraction has no age limits and Fastpass+ is available. Here now are five fast facts about Voyage of The Little Mermaid. 1. Voyage of The Little Mermaid debuted at Disney’s Hollywood Studios on January 7, 1992 in the Animation Courtyard Theatre. 2. The show put a heavy emphasis on puppetry as during the Under The Sea number, there are over 100 black light puppets on stage. 3. The evil sea witch, Ursula is performed by a huge puppet that is 12 feet high and 10 feet wide and requires several puppeteers to operate. 4. The first actress to portray Ariel in this show, Leanza Cornett, went on to become Miss Florida and then Miss America. She has gone on to have roles on TV Shows such as The Tick and CSI. 5. Voyage of The Little Mermaid has had a long run in the Animation Courtyard theatre but it was not the first show to play there. The puppeteer filled voyage under the sea replaced another puppet related show…Here Comes The Muppets. Ironically, that show didn’t use puppets, it used walk-around versions of The Muppets characters. Now it’s time to experience Voyage ofThe Little Mermaid. After the attraction audio, I’ll give you my thoughts on this Disney’s Hollywood Studios stage show. This is a binaural recording so if you have headphones put them on now as we experience Voyage of the Little Mermaid.